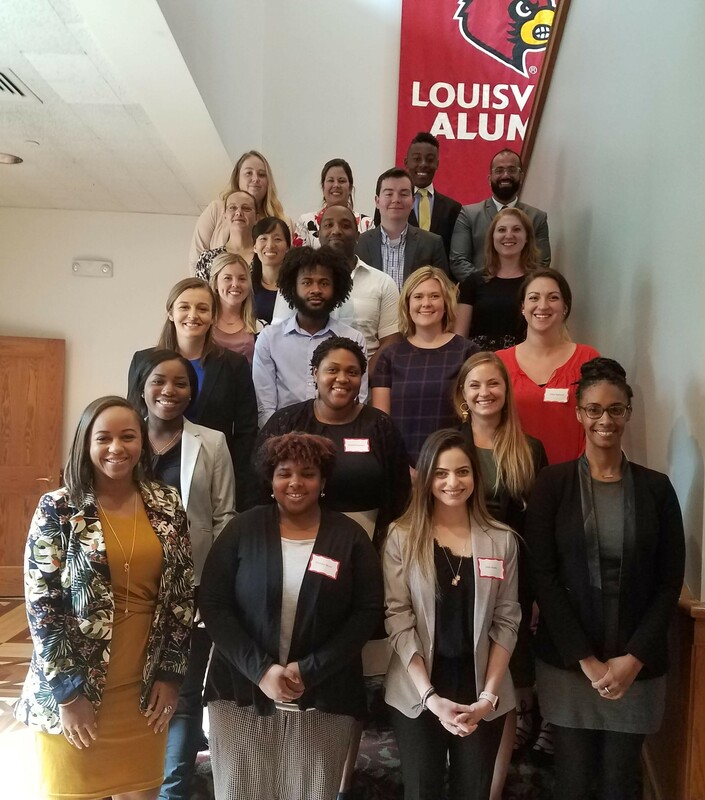 Purpose: The purpose of the Executive Mentorship Program is to assist students and early healthcare careerists in their growth and development. In addition, the intention of the Program is to motivate students and healthcare careerists to be active members of ACHE at the national and local level throughout their career. The mentoring relationship will last six to twelve months, at the discretion of each mentor/protégé team. Willingness to help develop students or early healthcare careerists. Faculty advisor signature encouraging participation in the program. Be open to solving issues and concerns with the Chairs. 4. The Executive Mentorship Program Committee will match mentors and protégés based on responses to the Mentor/Protégé Questionnaires received. 4. The Executive Mentorship Program Committee will match mentors and protégés based on responses to the Mentor/Protégé Questionnaires received. Inform the Chairs of any concerns or questions. Inform the Chairs or the student representatives of issues or concerns. Mentoring or advising is perhaps the truest form of dynamic learning. It involves two people with a commitment to assisting each other in furthering their professional careers. One constant in discussions held with successful individuals is that, almost without exception, they had an advisor or a mentor. Making the decision to mentor another individual is a conscious decision to return to your profession some of the expert advice that you may have been given (or wished you had been given) in the pursuit of your personal career objectives. One method of distributing this advice is through the establishment of a mentor/protégé relationship with an early healthcare careerist. In today’s highly competitive environment a protégé is expected to be proactive in seeking a mentor and in having set objectives and goals for the relationship. While a mentor offers the gifts of knowledge and experience, the protégé has the responsibility for taking full advantage of that knowledge by internalizing it, putting it into action, and ultimately for passing it on. There is only one way to pay back the debt owed as a result of a successful mentoring relationship, and that is by mentoring others. The mentor/protégé relationship is open-ended, but not static. As career paths change and professionals move on, the relationship will transition to another level and hopefully result in an enduring friendship. By definition a mentorship relationship is one that fosters growth in both parties so is a relationship that is destined to end, at least in the formal mentoring sense. A mentor is a person who is, or has been where you want to go, a person who is willing to assist you in meeting the challenges of reaching your next goal. It is important, as you establish your relationship with your mentor, that you understand what expectations are reasonable, and what expectations would be nice if they were fulfilled, and what expectations are not realistic. A person who is willing to share their assessments, viewpoints, and life experiences with you, to help you succeed. A person you can “bounce ideas” off of, before you take the risk of going public with them. A person that you can assist by sharing your areas of expertise. A person who is going to get you a job. A person who is going to give you all of the answers you need to be successful. Your mother, father, or fairy-god person. A personal counselor to deal with areas of your personal life outside of your career. A mentor/protégé relationship is not life long. As you move on in your career, and as your mentor moves on, there will be a day that even the best relationship will end, and hopefully become a warm and enduring friendship. Because by its definition an advising relationship is one that fosters growth in both parties, it is also a relationship that is destined to end, at least in the mentor/protégé format. How often do I have to meet with my mentor/protégé? Frequency of meetings is up to the individual mentors and protégés. However, it is recommended that matches meet every three to five weeks in the form of a face-to-face, e-mail, or phone meeting. Where do I meet with my mentor/protégé? Mentors and protégés are invited to meet wherever it is convenient and comfortable. What types of issues or topics are discussed when mentors and protégés meet? Some suggested discussion areas include: skill development, career planning advice, giving and receiving feedback on performance, how to deal with problems in an ethical way, action planning, and balancing personal, professional, and academic life. It is to be noted that the mentor is not responsible for finding the protégé an internship or job. We are both so busy with work, school, and our lives, how will we fit this in? What if my protégé asks my opinion on matters that are of a personal nature? It is recommended that at the start of the mentoring relationship, both parties identify what is and is not appropriate to talk about. Some matches may be comfortable talking about personal issues as they may relate to job performance and others may want to stay clear of personal matters all together. Each mentor/protégé pair should determine the boundaries of their mentoring relationship. What if we just don’t get along? It is important to note that either participant has the option to close the match. We highly encourage you to give the relationship a few months to develop. A. Anxiety and Uncertainty –Both parties are observing and assessing each other. Anxiety and uncertainty are present. It is especially important during this stage to keep the lines of communication open and acknowledge feelings. Give it time. TAKE IT SLOW! B. Honeymoon – Participants are excited about their new roles and feel that nothing could deflate the relationship. The converse may occur. Everything is great but it is not. Remember problems arise in all relationships. After all we are human and need to accept people as they are. C. Testing of Limits – Remember both participants in a mentoring match are usually new and in the process of exploring this type of relationship. During this stage, participants may be trying to “test” how loyal their mentoring partner is before confiding information. A. Reciprocal Relationship – The comfort level with one another has improved. The participants find it easier to share their likes and dislikes. Decision making is mutual. B. Building Trust – Openness, honesty, and consistency play a big part in building a trusting relationship. Talking begins to reflect trust when you start self disclosure. 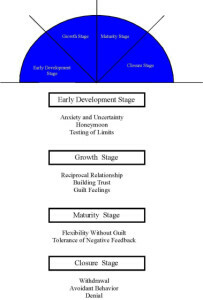 C. Guilt Feelings – In the growth stage guilt feelings are normal. Everyone has times when they are unable to follow through with plans. Letting one another know when this occurs can alleviate some of these feelings. Active listening is a fundamental communication skill. It tells one that you are interested. It involves listening carefully to the words and feelings expressed and repeating these facts in such a way that the speaker knows he or she has been understood. Active listening takes energy. This means listening to, rather than just hearing. Concentration is vital. The listener suspends judgment and prejudice and focuses on the feeling of the underlying message. By responding this way, you show you care about the person with whom you are listening. Share personal experiences with one another. This will encourage familiarity, helping one another feel more comfortable and communicative. Provide positive feedback to one another. Make eye contact. Be on eye level when talking. Control the urge to respond too quickly. Give positive feedback – verbal and nonverbal. 1. Clear your mind. Start with a clean slate. If you can’t break away from other pressing thoughts, you shouldn’t be in the conversation now. Focus. 3. Show the other person respect. You must have, and sincerely show, a real concern for what the other person has to say. Don’t be a victim of your own preconceived ideas that can keep you from being open to what you can learn from him/her. 4. Listen for the truth. Evaluate what is being said – not who is saying it. 5. Don’t interrupt. (Unless you should, then the rule is … interrupt.) Some people have a difficult time getting to the point. Patience can be rewarding. Some people need help getting to the point. You need to know the difference. 6. Don’t speak for more than 30-45 seconds without asking for comments. Studies show that the attention span of people engaged in conversation is only about 30 seconds or so. To keep the other person’s mind from wandering while you speak, keep your thoughts short and ask for comments or feedback regularly. 7. Don’t talk to yourself while the other person is talking. When you are talking to yourself, guess who you’re listening to? 8. Reflect back the other person’s comment before you respond. Be like a flat mirror, reflecting the message without distortion. For more in-depth reflection, include all aspects of the message (physiology, tonality and verbal). 10. Do the real gut-check … which is more important: who is right or what is right? And does it really matter who says it? You know it does … it’s much more important if they say it. Past mentoring efforts reveal it is not enough to simply match mentors and protégés and send them off to start a relationship. The natural chemistry of spontaneously formed relationships may be lacking. Having a matched mentoring pair work toward specific objectives will put mentors and protégés at ease and allow relationships to develop more naturally. When you are matching participants, an agreement between the partners needs to be established. The mentoring agreement is a critical element of the mentoring relationship. A mentor/protégé agreement is a written agreement, which details mutually agreed upon objectives for the match. It is the “road map” the match will follow to ensure the experience is successful and rewarding. The number one reason mentoring relationships are not successful is the lack of a clear, concrete action plan. Depending on the participants and the type of mentoring program, the mentoring agreement can range from the simple to the complex. At minimum, the agreement should include listing of key objectives and strategies for attaining those objectives through the mentoring relationship. A more complex agreement may include: roles and responsibilities of each participant; duration of mentorship agreement; meeting dates and times; key skills to be developed; and measures of relationship success. A sample agreement is attached that includes all of the above elements and is meant to be adapted to meet the mentor/protégé’s relationship style. At the conclusion of the agreement, how you will know the mentoring relationship was successful? We agree to abide by this relationship, the policies and procedures of the mentoring initiative and the organization. We also agree to a no-fault conclusion of this relationship if, for any reason it seems appropriate.